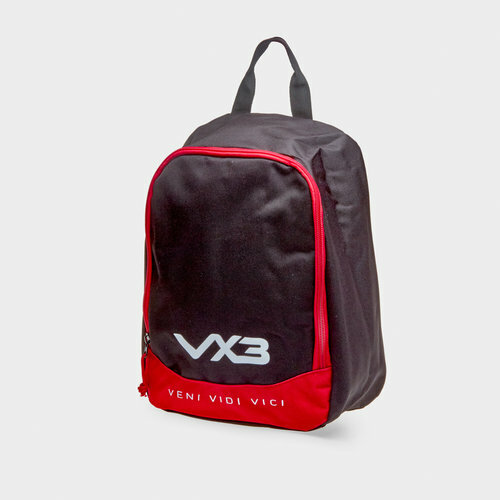 A bag designed specifically for your boots which will help keep your kit and clothing clean use this VX-3 Boot Bag in Black and Red now. This bag comes with one main zipped compartment large enough for you to store your boots in. When you finish your game you want your post-match clothes to be clean and not covered in mud from being squashed next to your boots so this is the ideal bag to use. This bag also has a handy carry handle for easy transporting. This bag comes in a black and red colourway. It has been finished with the VX-3 logo on the front at the bottom whilst the words "veni, vidi, vici" - the Vx-3 slogan - are written underneath that.